If you’re a fan of the ’90s, here’s a tour for you. 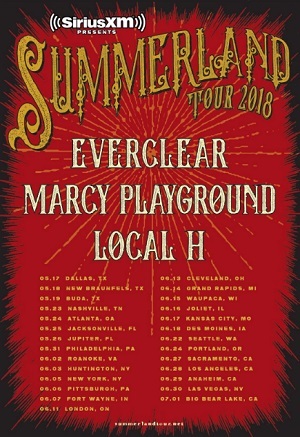 Everclear, Marcy Playground and Local H are joining forces for the annual Summerland North American tour, which will set off May 17 in Dallas, Texas, and run through a July 1 date in Big Bear Lake, California. For ticket information, head to SummerlandTour.net. Everclear spearheads the Summerland tour, and the trek has been going strong since 2012. The tour, which usually features alternative rock bands out of the ’90s, has featured a long list of the genre’s most recognized names, including Sugar Ray, Live, Gin Blossoms, Space Hog, the Toadies, Fuel, Eve 6, Filter and Soul Asylum. Alexakis added that Everclear’s set will offer something different than the usual concert. That will even be the case for fans who hit more than one show on the trek. 5/17 — Dallas, TX, Gas Monkey Live!